Developer, designer and engineer Alessandro Matera who has also created wearables such as the Tiny Watch, has this week unveiled a new Arduino creation for gamers in the form of the KeyChainino. 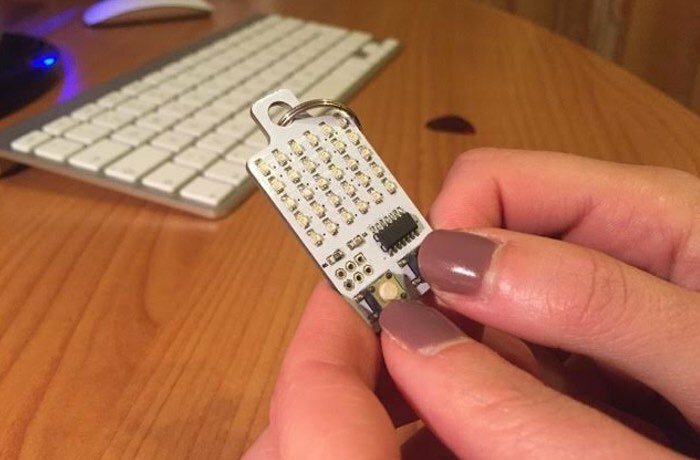 KeyChainino is a small development gaming board that can be programmed using Arduino and is equipped with 30 LEDs and a ATTiny84 microprocessor, and has been designed for ‘something to play with in those boring moments’. If you are looking for portable vintage game to put in your keychain,to use when you’re on the subway, on the bus, or simply when you are bored and you don’t know how to spend your time, KeyChainino is for you! Few months ago i was waiting for the bus and I realised that I was playing with my keys. So I had the idea to make something to play with in boring moments. With this idea, i’ve worked to a tiny device powered by the Atmel Attiny84 that controls a 6×5 Matrix LEDs. The Attiny84 doesn’t have so many pins to drive all the 30 LEDs, so i’ve used Charlieplaxing to drive it. But don’t worry about it! I’ve created a simply function to drive the LEDs just like a simple and common LED matrix! For more information on the KeyChainino Arduino programmable board jump over to the official website for details, specifications and is available to purchase for €13 and powered by a CR2032 (3V) Coin-cell battery.